Backes & Strauss is the world’s oldest diamond company and was established way back in 1789. The luxury brand has just introduced their latest watch – Piccadilly Princess Royal Emerald Green. In a partnership with Gemfields, Backes & Strauss has delivered a beautiful timepiece that is as stunning as it is technologically advanced. Gemfields is known for their expertise as a key supplier of colored gemstones. In collaboration with Backes & Strauss, who brings well over two hundred years in the diamond industry, a luxurious piece of art and timekeeping has been developed – the Piccadilly Princess Royal Emerald Green watch. The bespoke Piccadilly Princess Royal Emerald Green model becomes the third watch that’s part of a bespoke, five watch collection. The prior two watch releases were the Piccadilly Princess Royal Colours in 2014 and Piccadilly Princess Royal Blue introduced earlier this year. in 2015. The gorgeous Piccadilly Princess Royal watch series commemorates the important, 225th anniversary milestone of Backes & Strauss. Backes & Strauss has revolutionized the diamond industry since the late 1700’s with new diamond cutting techniques and incredible designs of its luxury jewelry. 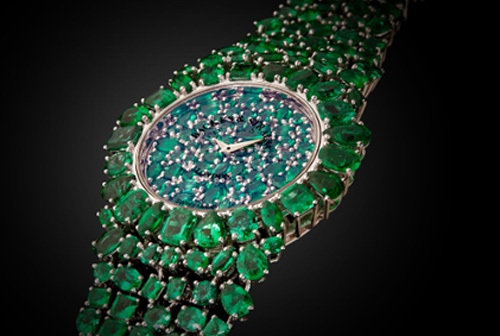 The Piccadilly Princess Royal Emerald Green watch consists of 245 Zambian emeralds that includes 10 different cuts. The total weight of the precious green emeralds is 31.91 carats. The stunning gems were professionally chosen and cut by the experts at Backes & Strauss. Do you dream of owning a luxury watch to add to your collection or make it the center of talk during social gatherings? Contact The Life of Luxury and we can help you procure a luxury timepiece like the new Piccadilly Princess Royal Emerald Green watch from Backes & Strauss. Come back often and follow our luxury blog to keep abreast of all the latest news and new watch releases in the luxury jewelry industry.